50% support Sanders’ plan to lower the estate tax threshold. 33% favor a Republican bill to repeal the tax. GOP support both repeal and expansion equally at 43 percent. Among a recent flurry of proposals to increase taxes on the wealthy, one more policy — a levy on inheritances of $3.5 million and more — has gained some traction with voters. Sen. Bernie Sanders (I-Vt.), a potential 2020 presidential hopeful, has suggested lowering the threshold of the estate tax to $3.5 million from where it currently stands at $11 million, a measure that would increase the number of Americans subject to the tax. Fifty percent of voters in a Feb. 7-10 Morning Consult/Politico survey favor the proposal, while 29 percent oppose it. The poll surveyed 1,991 registered voters and has a margin of error of 2 percentage points. 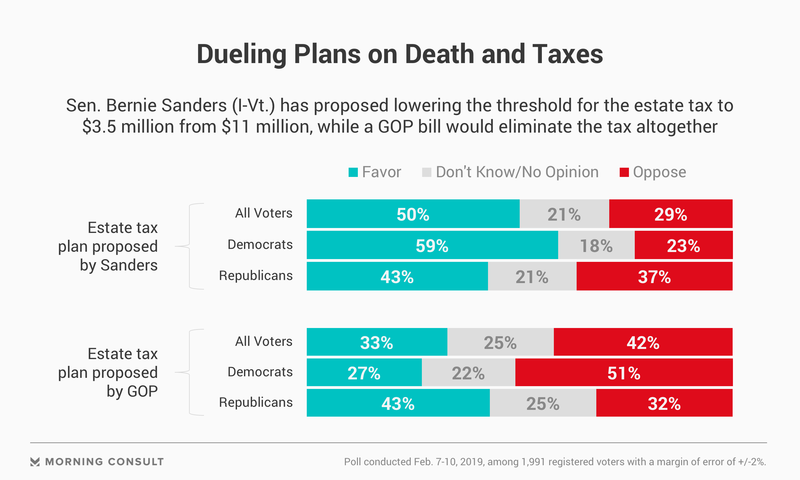 Sanders’ expanded estate tax fared better with Democrats, with 59 percent supporting the plan and 23 percent opposing it, while Republicans were more closely split, 43 percent to 37 percent. By contrast, a recent GOP measure introduced by Sen. John Thune of South Dakota and co-sponsored by more than two dozen other Republicans to repeal the estate tax did not gain widespread support among voters. The plan garnered 42 percent opposition and 33 percent support among all voters. The proposal was more popular with the party’s own voters, earning the same share of GOP support — 43 percent — as Sanders’ plan, with 32 percent opposed. A slim majority (51 percent) of Democrats rejected the proposal, while 27 percent supported it. With his proposal, Sanders joins the chorus of progressive politicians and Democratic presidential hopefuls calling for higher taxes on the wealthy. Sen. Elizabeth Warren (D-Mass. ), who officially announced her 2020 presidential bid over the weekend in a speech that heavily featured themes of wealth inequality, suggested a policy that would put a wealth tax on households worth more than $50 million. Rep. Alexandria Ocasio-Cortez (D-N.Y.) has proposed a 70 percent marginal income tax on those who earn more than $10 million. Warren’s proposal, a 2 percent tax on household wealth more than $50 million and 3 percent on wealth in excess of $1 billion, garnered 61 percent support from voters, making it the most popular measure to increase taxes on the wealthy, according to a Morning Consult/Politico poll conducted Feb. 1-2 among 1,993 registered voters. Ocasio-Cortez’s income tax trailed Warren’s and Sanders’ plans at 45 percent. The poll has a 2-point margin of error. Warren’s proposal is likely the most popular because of its high threshold, said Vanessa Williamson, a fellow who studies attitudes about taxation at the Brookings Institution. The taxation rate, which starts at 2 percent, also sounds low — especially when compared to Ocasio-Cortez’s 70 percent marginal income rate on the top earners. “That 2 percent number is small and much more comfortable for people, and the number at which it applies is much higher,” she said. While Sanders’ estate tax plan would apply to people with inheritances of $3.5 million or more, estate taxes only apply when wealth passes from one person to the next, and voters tend to support estate taxes when they understand who they apply to and when they come into effect, Williamson said.